Embedded devices all around us are being transformed into "Interconnected Smart Devices". All these devices need communication bridges to pass raw data through the network to reach central servers for processing. For devices installed at remote, unattended and harsh environments, a stable and reliable communication bridge between the end device and the central server is a must. As a global leader in the embedded computing market, Advantech is committed to collaborating with our partners and customers to help you develop the IoT world. 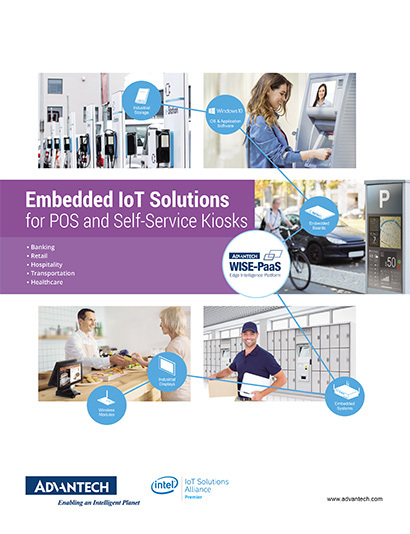 With years of experience, Advantech provides comprehensive embedded product ranges and customer-centric design-in services to help customers develop reliable and innovative intelligent embedded computing solutions. 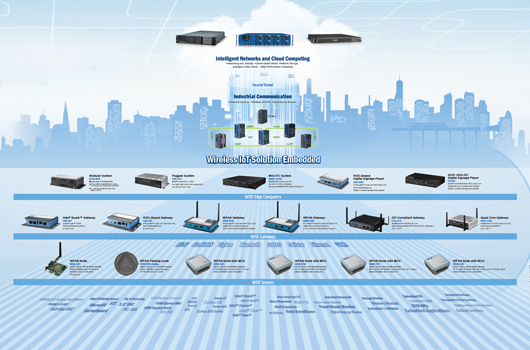 To address the market for IoT applications, Advantech developed a series of integrated IoT solutions and services, and accelerating the IoT value chain & ecosystem. 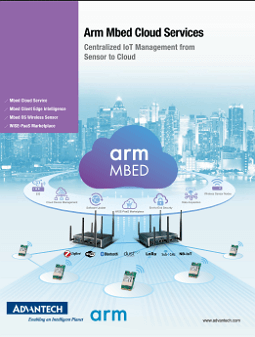 Moreover, following the WISE-Cloud concept, all embedded solutions will be integrated with all types of wireless data acquisition solutions, WISE-Cloud software for manageability, security functions, and sensor-to-cloud connectivity solutions. Wireless connectivity is essential for IoT devices. There are many communication protocol standards such as WiFi, Zigbee, USB, RS232 and Bluetooth in the market. 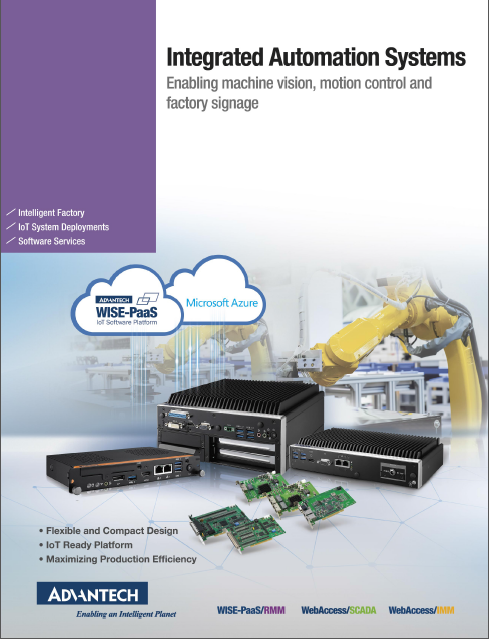 Advantech WISE-IoT Solutions provide redundancy and fail-over in time, frequency and space to ensure very high reliability even in the most challenging radio environments. 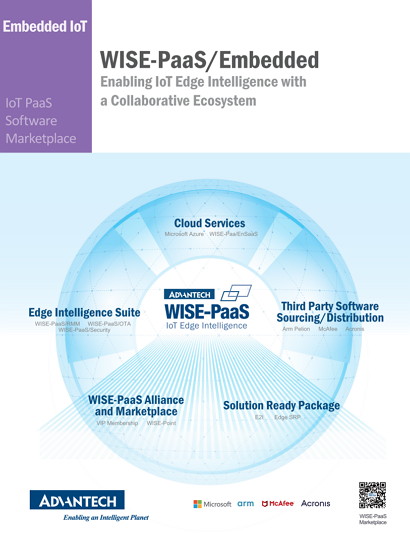 WISE-IoT Solutions also provide the intelligence required for self-organizing, self-healing mesh routing. The result is a network that installs easily with no specialized wireless expertise, automatically adapts to unforeseen challenges, and can be extended as needed without sophisticated planning. A typical IoT structure collects data via sensor nodes, passing data to the server. After storing, processing and analyzing, the system will be able make smart decisions based on the 3 main elements of sensing, communication and management via cloud computing services. 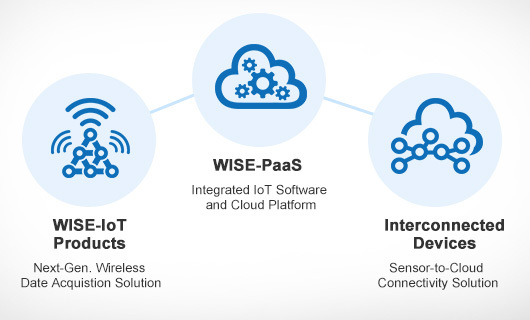 To streamline System Integrators (SI) development process and effort, Advantech’s Integrated IoT Solutions & Services cover these 3 key elements and have the help of WISECloud to connect and manage all IoT-based devices and systems. As the IoT connects more remote sensors and devices together, there will be heightened sensitivity to controlling access and ownership of data. 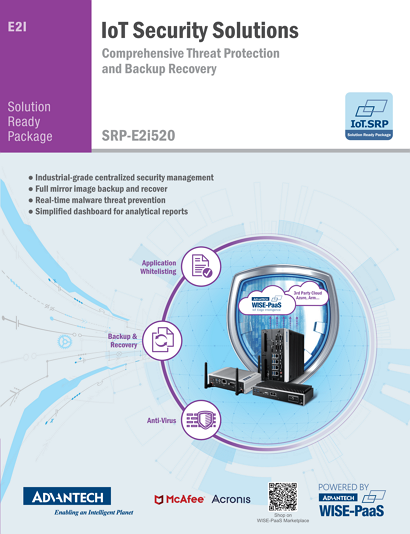 Through Advantech WISE-Cloud, SI can manage all remote devices easily with highly secure mechanisms built-in.